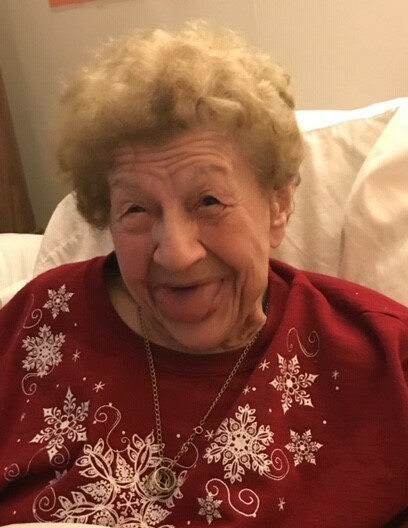 Mabel V. Umbenhauer, 96, of Pine Grove, passed away on Wednesday, March 20, 2019 at the Tremont Health and Rehab Center. Born on December 23, 1922, in Pine Grove, she was a daughter of the late Cleveland and Elizabeth Zerbe Zerbe. Mabel was a member of St. Peter's Lutheran Church in Pine Grove. She worked as a Seamstress for Canoe. Mabel loved her family and loved spending time with them. Preceding her in death were her husband, Allen "Fat" Umbenhauer, on June 5, 2003, two sons, Robert Umbenhauer and Allen Umbenhauer Jr.; six sisters, Dorothy Nagle, Carrie Zimmerman, Thelma Hubler, Emma Kohr, Clara Schierer and Irene Anspach; four brothers, Robert Zerbe, Cleveland "Batch" Zerbe, Harry Zerbe, Melvin Fidler. Surviving are two daughters, Lorraine Shelters and Alice Aungst; a son, Eugene "Utch" Umbenhauer, all of Pine Grove; 4 grandchildren, 10 great grandchildren, 6 great great grandchildren; many nieces and nephews. Funeral Services will be held on Saturday, March 23, 2019 at 11:00 A.M. at the H. L. Snyder Funeral Home, Inc., Pine Grove with Pastor Barry Spatz officiating. There will be a viewing on Saturday, March 23, from 10:00 A.M. until 11:00 A.M. at the Funeral Home. Interment will follow in Jacob's Lutheran Cemetery, Pine Grove. In lieu of flowers, the family would prefer contributions be made to the Parkinson's Disease Association, 135 Parkinson Avenue, Staten Island, NY 10305, in her memory. You may send condolences to the family at www.hlsnyderfuneralhome.com.